Are you looking for hardwood gymnasium floors but don't have the budget to afford one? SignaFlor is a low-maintenance pad and pour athletic floor surface that is seamless, durable, and highly shock absorbent to reduce the risk of injury to athletes, making it an excellent alternative to hardwood floors for gymansiums. 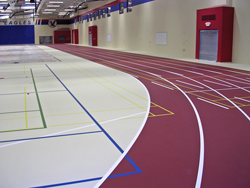 SignaFlor makes a great surface for multi-purpose rooms, weight room floors, indoor running track surfaces, gym floors, aerobics room flooring & locker room floors. This pad and pour floor's ability to be modified to your optimum coefficient of friction makes it very versatile, and it's shock absorbency & seamless uniformity makes it the ideal surface when wanting to build a safe environment. When comparing pad and pour floors vs, hardwood gym floors, there are many clear benefits and advantages that this seamless floor offers. Available in 12 standard seamless floor surface colors and 7 line colors, with custom options so you can match your school or corporate colors. Take your team's spirit to new heights and strike fear and intimidation to visiting opponents with a professional graphic display of your logo and color scheme. 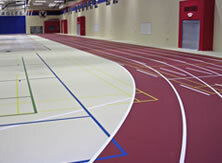 Want cost savings to come from your sports flooring? 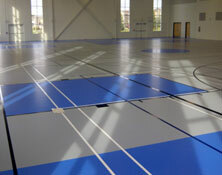 This can be the last athletic surface you would need to buy for your gymnasium. SignaFlor has a renewable wear surface that can easily be restored, making it capable of lasting the life of the facility! Updated your school colors or had a mishap that damage part of the floor? It's easy to repair small areas, change colors or modify floor graphics if necessary, a feat that wood sports floors cannot match without being expensive and time consuming. 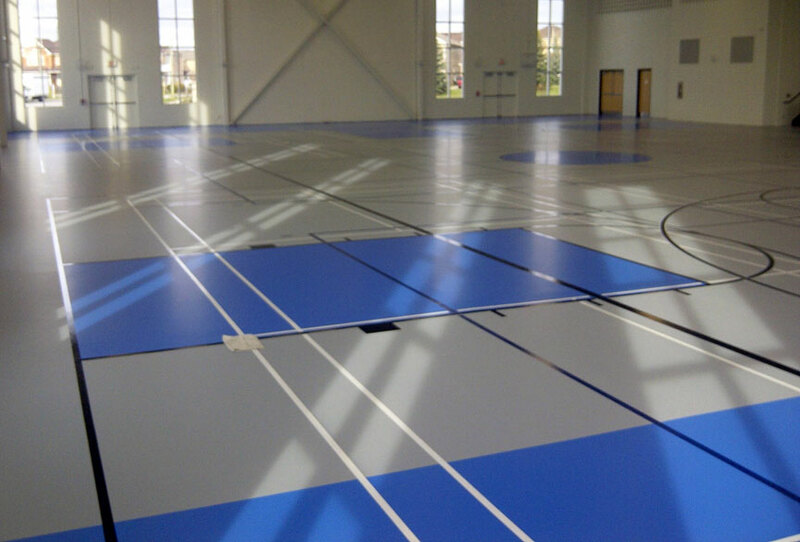 Being an ultra-tough, resilient gymnasium flooring surface means you can hold non-sporting events like parties, rallies & dances, with the ability to hold-up to non-athletic footwear, tables, moving chairs & bleachers. SignaFlor meets LEED certification requirements for use of recycled products. The shock absorbing rubber mat layer is made from 100% recycled tires. Instead of chopping down precious trees, your seamless gymnasium floor can help the environment by reducing landfill waste. SignaFlor pad and pour flooring utilizes a seamless polyurethane structural layer that is strong, durable and free of mercury, lead and other heavy metals. Signaflor offers the ability to adjust its level of shock absorption during installation to meet your specific needs and requirements. It's characterized by a consistent system thickness for superior force reduction, controlled performance, and is available in different densities and thickness to adapt to unique applications. SignaFlor's customizable capabilities as a seamless floor meets any application need for every age group, activity, and budget. 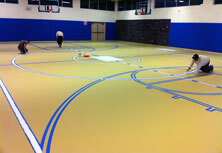 How does SignaFlor pad and pour athletic flooring work? 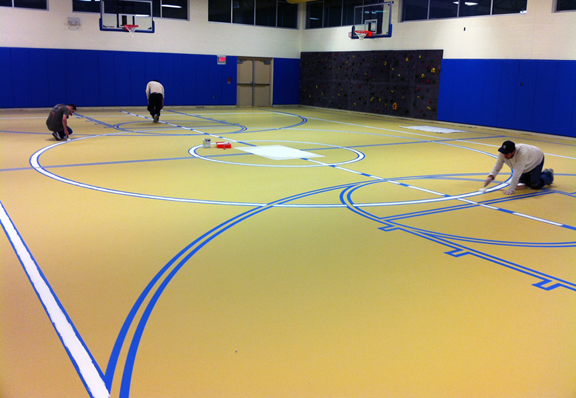 Contact One Of Our SignaFlor Seamless Gymnasium Floor Experts Today! In order to execute the perfect pad and pour floor installation, preparation is key. Our certified sports flooring expert will work with you and/or your general contractor to ensure your concrete subfloor is properly prepared. 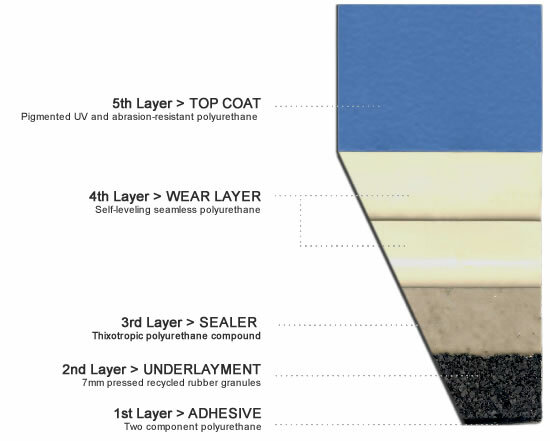 Once the subfloor meets our strict quality standards, we then apply a two-component polyurethane basemat adhesive, followed by a prefabricated basemat made of recycled rubber granules pressed to a constant thickness determined by your shock absorption needs. The SignaSports™ standard basemat thickness comes in 4,6,7 & 9mm. 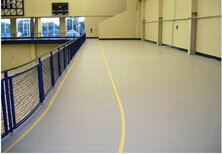 This rubber layer is sealed with a coat of thixotropic polyurethane compound followed by a self-leveling seamless polyurethane structural coat. Next comes the fun part! The SignaSports™ Top Coat is a pigmented UV and abrasion resistant polyurethane layer in the color you have chosen, topped off with colorful line paint applied to meet athletic guidelines and to suit your specific sporting needs.